Can You Win A Spelling Bee If You Know 99 Percent Of The Words? You are playing your first ever game of “Ticket to Ride,” a board game in which players compete to lay down railroad while getting so competitive they risk ruining their marriages. At the start of the game, you are randomly dealt a set of three Destination Tickets out of a deck of 30 different tickets. Each reveals the two terminals you must connect with a railroad to receive points. During the game, you eventually pick up another set of three Destination Tickets, so you have now seen six of the 30 tickets in the game. Later, because you enjoyed it so much, you and your friends play a second game. The ticket cards are all returned and reshuffled. Again, you are dealt a set of three tickets to begin play. Which is more likely: that you had seen at least one of these three tickets before, or that they were all new to you? You are competing in a spelling bee alongside nine other contestants. You can each spell words perfectly from a certain portion of the dictionary but will misspell any word not in that portion of the book. Specifically, you have 99 percent of the dictionary down cold, and your opponents have 98 percent, 97 percent, 96 percent, and so on down to 90 percent memorized. The bee’s rules are simple: The contestants take turns spelling in some fixed order, which then restarts with the first surviving speller at the end of a round. Miss a word and you’re out, and the last speller standing wins. The bee words are chosen randomly from the dictionary. First, say the contestants go in decreasing order of their knowledge, so that you go first. What are your chances of winning the spelling bee? Second, say the contestants go in increasing order of knowledge, so that you go last. What are your chances of winning now? Congratulations to 👏 Eric O’Neill 👏 of Madison, Wisconsin, winner of last week’s Riddler Express! Last week, we broke out the dice to play a century-old baseball simulation game called Our National Ball Game, wherein each roll of the dice corresponded to some baseball outcome: 2-6 was a foul out, 1-1 was a double, 6-6 was a home run, and so on — you can find the full list here. How closely does such a list and a bunch of dice throws simulate the modern iteration national pastime? Specifically, what was the average number of runs that would be scored in nine innings of dice play? What was the distribution of the runs scored? Typically, Our National Ball Game is much higher scoring than real baseball, with about 30 runs scored per game (compared to about nine in the real sport). This was a problem of meta-simulation: Whereas the dice game simulated real baseball, you were meant to simulate the dice game (probably using a computer to save time). 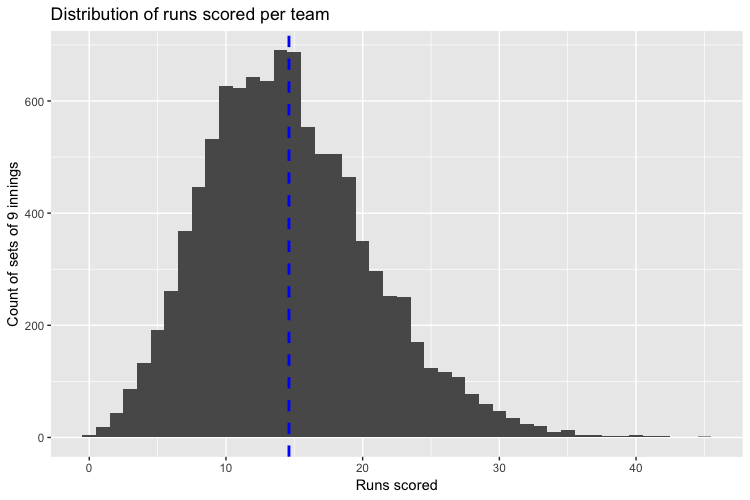 Solvers Julian Gerez and Ricky Martinez did just that and blogged about their approach, finding, after 10,000 innings of play, that each “baseball team” scored about 15 runs per game, for a total of about 30 runs per game, according to the simulated distribution shown below. 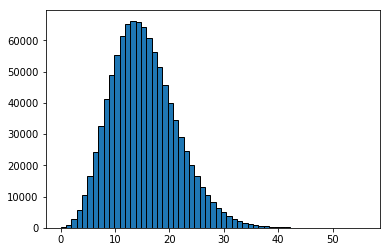 The computer scientist Peter Norvig was also kind enough to share his code — after a million computer-simulated dice-simulated innings, he found an average of just over 15.1 runs per team, and was able to smooth out the distribution as shown below. A million innings! Perhaps we’ve finally found a solution to baseball’s pace-of-play problem. Congratulations to 👏 Tyler James Burch 👏 of Naperville, Illinois, winner of last week’s Riddler Classic! High scoring baseball is fun and all, but let’s say you wanted your game to be more faithful to real baseball than raw excitement. How could you tweak the list of rules — the correspondence between dice rolls and baseball outcomes — to create a game that more closely matched the run distribution in real baseball? Our winner this week, Tyler James Burch, proposed the following list of rules, which I propose to call Burchball. Again, the fidelity of this tweaked game can be measured with computer simulations. 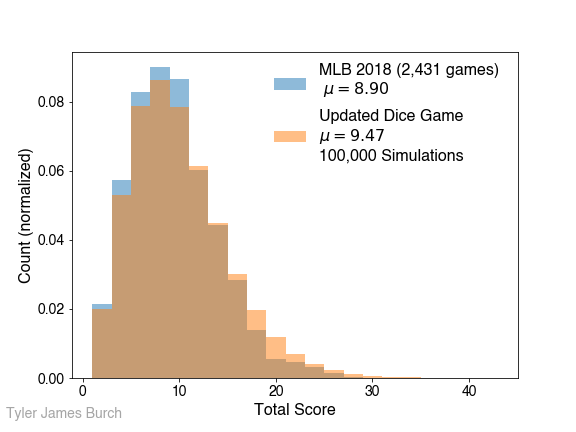 In this case, Burch says his game’s simulated scoring outcomes match real baseball quite closely, as shown his chart below, in which Burchball scores are compared to MLB data from last season.